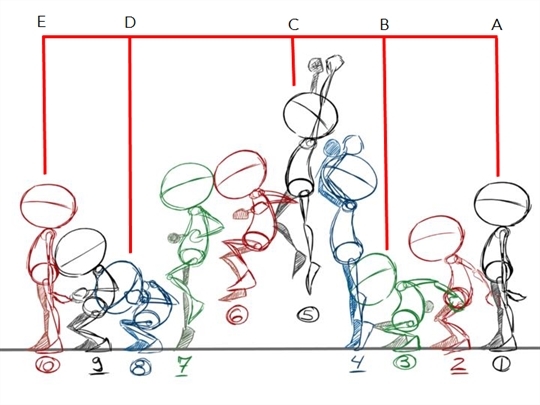 Keyframes are the significant poses in a character's action, such as the first and last positions in a jump. In-betweens are all of the drawings between the keyframes; they move the action from one keyframe to another. The more drawings there are between keyframes, the slower the action will appear. This is because more drawings means that there is more time to complete the same action. In animation, space = time. The more space there is between drawings, the faster the action will appear to progress. And vice versa; the less space there is between drawings, the slower the action will appear. 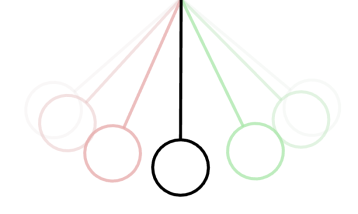 Basically, when two drawings are far apart, the time it takes to go between them appears shorter than the time taken to go between two drawings placed close together. Pose-to-pose animation is characterized by the process of first drawing your key poses at significant points in the action, refining the key drawings, and then doing the in-betweens. This process gives the creator more control and ensures the accuracy of the final result. This is how you worked when you created the pendulum animation. You started by creating your key poses! Straight ahead animation is drawn from the first position to the last in a linear sequence. There is very little planning in this methodology, and where the character ends up and how it gets there can be a surprise for both the audience and the animator. While this approach is a lot more spontaneous and creative, it can create inaccurate results.